Protected Cruiser New Orleans (ex-Amazonas) in 1898 as purchased. Two of the 4.7" (12 cm) guns are amidships near the funnels. U.S. Naval Historical Photograph # NH 45112. In 1895, the Brazilian Navy ordered four cruisers from the British firm of Armstrong, Mitchell and Co., Newcastle-on-Tyne. Brazil took delivery of only one of these, Almirante Barroso, while another was sold to Chile and renamed Ministro Zenteno. In March 1898 the remaining two were sold to the USA, which was interested in obtaining them in order to prevent their sale to Spain. As a result of this purchase, eight 4.7"/50 (12.7 cm) Armstrong/Elswick guns wound up in USN service where they were designated as the Mark 3. These guns were not well liked in the USN as they used non-standard ammunition and spare parts. For those reasons, in 1903 they were replaced on the two cruisers with 5"/50 (12.7 cm) guns. In 1907 the removed guns were emplaced in the Philippines on Grande Island and at the mouth of the harbor at Subic Bay. One gun made its way back to Britain where it was used on the armed yacht HMS Eileen during World War I. Constructed of tube, jacket, four hoops and was hooped from breech to muzzle. Actual bore length was 48.9 calibers. Known as "large case" guns, apparently to distinguish them from earlier "small case" guns, described below. Nomenclature Notes: The USN purchased two 4.7"/47 (12 cm) Mark 1 and one 4.7"/42 (12 cm) Mark 2 "small case" guns from Vickers & Sons in the 1890s, apparently for evaluation purposes. There were two other 4.7" (12 cm) guns, designated as Mark 4 and apparently obtained shortly after 1906, but no details survive. All of these guns were "surveyed and condemned" sometime prior to 1924. 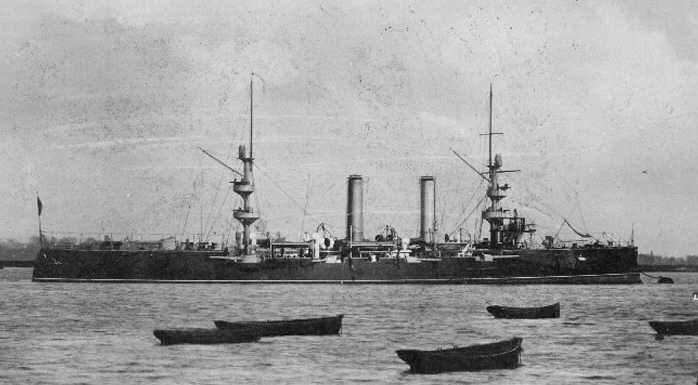 The USN also purchased a number of 4.7"/27.5 (12 cm) Model 1906 M.I. land guns for the Marines. The US Army purchased similar guns for use in the "Endicott" series of Coastal Fortifications. Actual bore diameter of all British 4.7" guns was 4.724" (12 cm). The details that follow are specifically for the 4.7"/50 (12 cm) Mark 3 guns as used in USN service, but the guns on Brazilian and Chilean ships should be identical. ^This table assumes that standard British projectiles were imported for these guns. 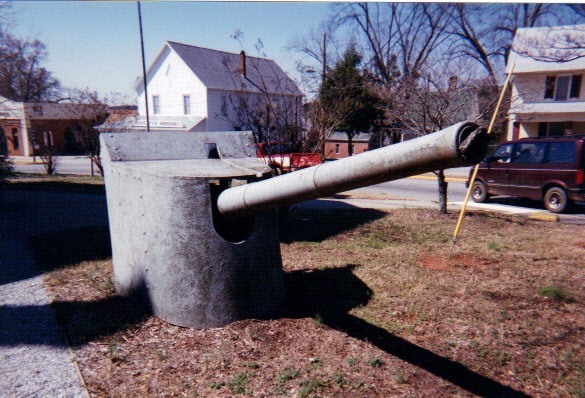 Army 4.7" (12 cm) Armstrong gun Serial Number 9718 formerly emplaced at Fort Pickens, Florida and now a Memorial in Danielsville, Georgia. These Army guns were similar in design to those used on the New Orleans class cruisers. Photograph copyrighted by Jim Royston and used here by his kind permission. 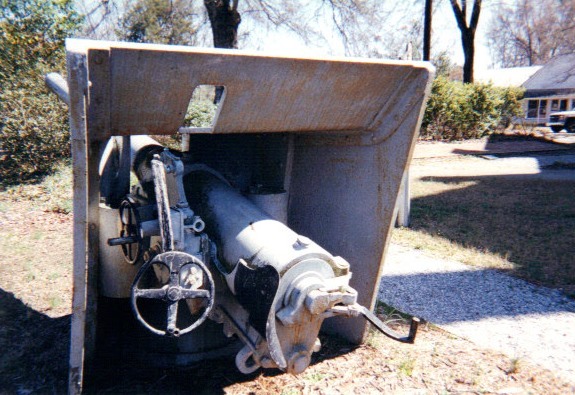 Rear view of above gun. Photograph copyrighted by Jim Royston and used here by his kind permission. "Modern American Seacoast Defense" Revised 04 February 2013 on line at The Coast Defense Study Group, Inc.